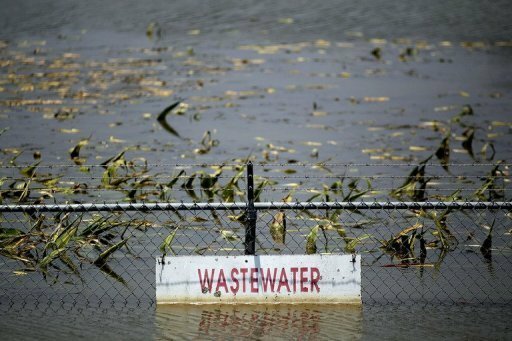 A wastewater treatment plant is inundated by the Yazoo River floodwaters on May 22, 2011, near Yazoo City, Mississippi. WASHINGTON (AFP) – (AFP) – US scientists may have found a new way to produce clean energy by way of dirty water, according to a new study out Monday. The engineers have developed a more efficient method to use microbes to harness electricity from wastewater. They hope their technique could be used in wastewater treatment facilities and to break down organic pollutants in the “dead zones” of oceans and lakes where fertilizer runoff has depleted oxygen, suffocating marine life. “We call it fishing for electrons,” said environmental engineer Craig Criddle, one of the lead authors of the study published this week in the Proceedings of the National Acadamy of Sciences (PNAS). “You can see that the microbes make nanowires to dump off their excess electrons,” Criddle added. Scientists have long known of microbes, dubbed exoelectrogenic, that live in airless environments and are capable of “breathing” oxide minerals, instead of oxygen, to generate energy. The researchers said their new model is simple, yet efficient, and can harness about 30 percent of the potential energy in the wastewater — about the same rate as commercially available solar panels.